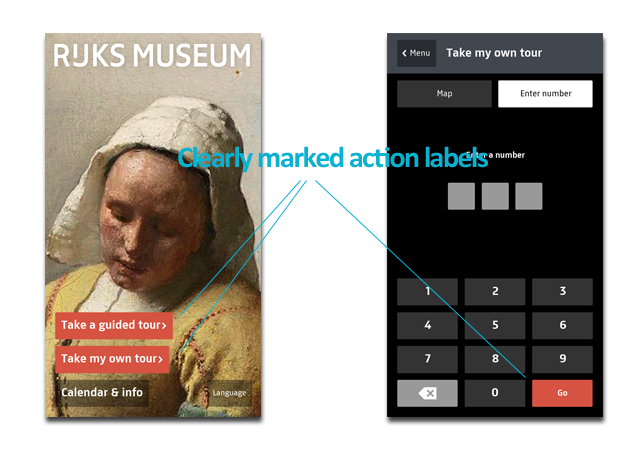 Your personal museum guide: A fine UX example of the use of an app by a museum - Harold Tor. 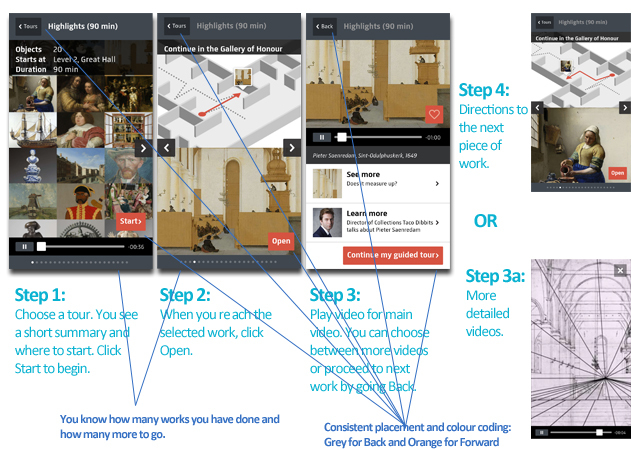 If you own a museum, art gallery or runs an exhibition, have you ever thought about producing an app for your visitors? If so, how much have you considered user tasks analysis and customised your app’s user experience to facilitate those tasks? 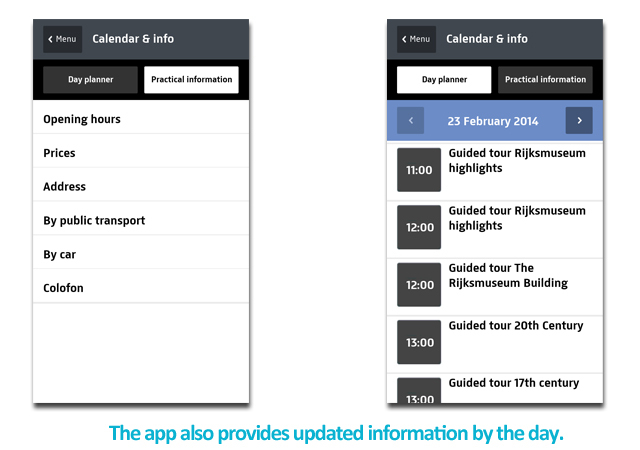 Here is a great example of the use of a mobile app by the Rijksmuseum in Amsterdam. Last November I visited the Rijksmuseum in Amsterdam, which reopened on 13 April 2013 after closing for renovation for more than then years since 7 December 2003. Opened in these premises in 1885, the Rijksmuseum houses 8000 pieces of art and historical artefacts which date between 1200 right up to the current years. This is the place to visit, when you want to see masterpieces by the great Dutch painters, such as Rembrandt, Hals and Vermeer. When I arrived early in the morning, there was already a queue, this is after all the most visited museum in the Netherlands. There was a nice girl who approached us to conduct a survey on visitors in which we gladly participated. It was during the conversation with her that I discovered this app. “Oh yeah, you should go download it now. We have free wifi here in the museum,” she recommended. And so I did. 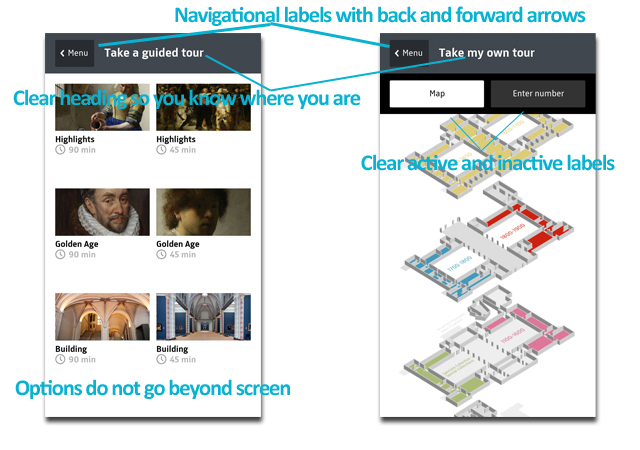 Once opened, the app offers very clearly the options you have: Guided tours, Conduct your own tour, Calendar and other information, Language options. I clicked on the guided tours, and was presented with an overview of 6 different tours with varying timespan. I really liked this because then, I could plan my tour around the limited time I had. On top of that, it was a great feeling being able to skip past the annoying tour groups and lost tourists. The guided tour is composed of a series of masterworks or ‘highlights’ as they call in the app. When you arrive at a masterpiece, just play the video, which explains very briefly what the work is about and the history of the piece. If you want to know interesting facts about it, such as special symbols hidden in the painting, there is often another video that explains that. I appreciate this option and I find it a good UX practice, that they put themselves in the shoes of the user: if I find the work boring, I won’t want the details and the history mixed together in one long video. Another feature that shows they have really put some thought into this, is the provision of expert opinion in yet another video: This allows me to listen to what other people are saying about the work, and lets me compare it with my own views. Visiting a museum is a thought-provoking trip. When designing an app for the user, think about user tasks: how can we service these user tasks – physically, visually and mentally. This is what good UX is about. Another UX feature I found, was the intuitive design. Orange labels for action buttons like ‘Continue the tour’, ‘Go’. Short but comprehensive titles. Clear headings on top to know where you are in the app. Light-grey labels for active labels, dark-grey labels for inactive labels. Short arrow to the left for ‘Back’ and right arrow for ‘Next’. The interface was clearly designed for mobile phones: length of a page rarely goes beyond the length of the screen, short succinct data helps to keep it clean and clear. The white space allows your eyes to focus on the essentials. After completing guided tour, I still had some time at hand, so I wandered around to do my ‘own tour’. When I got to an artefact I liked, I searched high and low for the number which I could key in. I finally did, but it did not find anything. I was disappointed. Then I moved on to another piece of work, where I found a star sign with a number. I keyed in THAT number and I got to the information I was looking for. But on the work itself, there was no indication this was the number for the app. Nor was it aligned with the item number which they place somewhere near the signs. 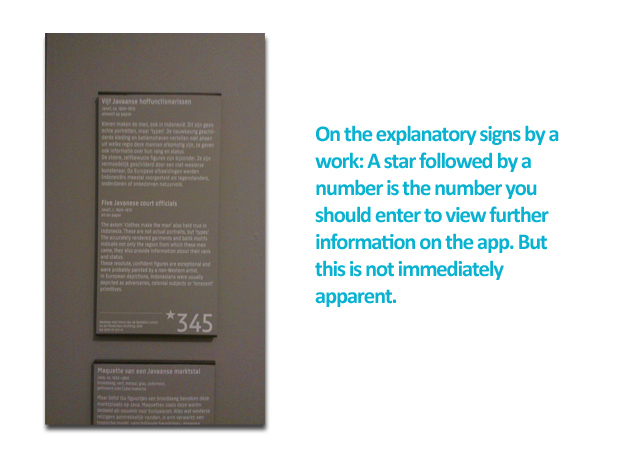 With two different sets of numbers, and the lack of clear signage this starred number was for the app, it was not immediately clear to the user what to do to access the info. I also wished they had advertised this on their site (If they did, it was well-hidden). I actually visited the site often before my trip because I really looked forward to it. As a result, I didn’t bring my earphones with me: It was very noisy in the halls because of the tour groups I could hardly hear the videos. On top of that, playing videos constantly for 90 minutes was a huge drain on my mobile phone. At the end of the tour, my phone battery died and I wished I could charge it to use Google Maps for the rest of the day for navigating around the city. On the whole, I think this is a GREAT app that the Rijksmuseum has come up with. They clearly put their thoughts into UX and user tasks analysis. I wish all museums could amulate this effort! On the other hand, with such a fine product, it is a pity that so little is put into making this more prominent or pushing users to download it. To be honest, this WILL lower the noise level in the halls: everyone will be listening to the explanations through their earphones, while quietly looking at the masterpieces. That will be paradise! Intuitive UX. No learning curve required. It provides an on-site guide to navigate to the important works of art, so you can skip past the crowd and get straight to business. It provides different options for guided tours so that you can tour according to the time you have. It is available in a whopping 9 different languages. You can do your own tour because they provide you with a detailed flour plan of every flour. So much information is provided in the app for each masterpiece: a brief explanatory video, another video about interesting details, videos of expert opinions. Videos came with the app, so you do not depend on the wifi for video download. Indoor GPS could be harnassed for better indoor navigation through the use of wifi signals, like what Google Maps and WiFiSLAM/Apple are doing. They should promote the app more: no mention in the museum, nor on their website. They should have warned visitors before, so they can bring earphones with them. Strain on the phone battery, so prior warning was crucial so I could have brought my charger with me. Alignment of artefact number and the item number in the app. Here are the download links to the Rijksmuseum app in iTunes and Google Playstore. In the course of writing this article, I am reminded of a non-issue that was discussed in my professional life: That one should not have an app because the trend is geared towards RWD websites. Apps have their place and purpose. This shows a gross misunderstanding that apps are simply mobile versions of websites. If you do not need to make full use of the mobile features, you do not need an app. If you cannot provide your users with the same level of information they need, such as the example above (like the pre-loading of videos in an app as compared to embedded videos on a website that require wifi or data access), then an app is needed. I do agree that sites should have responsive designs to cater to the huge arrays of screen sizes we have today. But there are no hard and fast rules. The only way to determine whether you need an app, a responsive website, a mobile/tablet version of your full site depends on what information tasks you and your users do.